The History Group organised an Open Afternoon for 2016 rather than an Open Day, held on Saturday 10th September from 1 to 4pm in the Willow Works. The theme this year was Village History and Family Research. 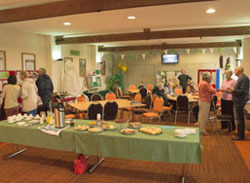 Tables and displays were set up around the function room for visitors to see showing lots of information and items of interest. 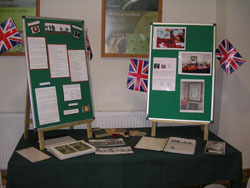 The Research Table included various files and documents on the history of both villages, plus website information. These could be viewed either in the folders, on the laptop or through the microfiche. Copies of some could also be requested. 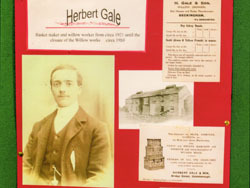 The Herbert Gale display showed information about him, his family and the willow industry in Beckingham. He was a successful businessman and the last person to run the Willow Works before the industry went into decline. 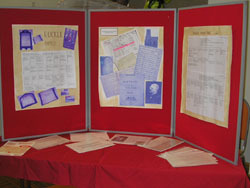 The Duckle Family display included their family tree and other details. They were prominent land owners in the area who have four commemorative plaques in the Church along with two stained glass windows in their memory. 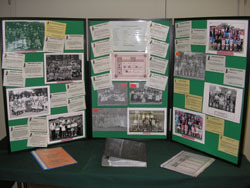 The Beckingham School display had photos of past pupils, various documents and records. These included many memories and anecdotes from those who had attended the school over the years. The War Memorial display showed details on both the Beckingham and Saundby war memorials. There was information on servicemen from both villages who died as a result of the two World Wars and where they were laid to rest. There was also information on some prisoners of war who worked in the area. 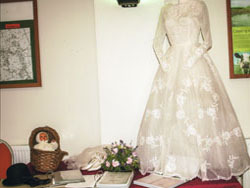 The Birth, Deaths and Marriages display included copies of church registers, a wedding dress with accessories, a funeral hat and gloves and a willow cradle. There were other tables with information on local businesses, sports and religious buildings plus some maps which visitors could have copies of if requested. Refreshments of tea, coffee, squash and delicious homemade cakes were available throughout the afternoon. Entrance was free and there was a steady flow of visitors. Thanks go to all who organised, helped and attended the event making it a success. The History Group usually meet on the last Thursday of each month in the Willow Works at 7pm. Their calendar includes various speakers and visits and new members are always welcome. Click here to go to History Group Diary of Events. Click here to go to History Group History page.